A little while ago I posted about good old Jonathan Adler & his gorgeous Utopia range (still obsessed with it… why oh why is it so expensive?!) … but the other day I came across something on Bright Bazzar (it's good - be sure to check it out!) that nearly made me weep with joy, not only is it beautiful, colourful and animal themed, but it's about 1/4 of the price of J.A, take a peek at the amazing Bliss in the Woods homeware range from Our Workshop! 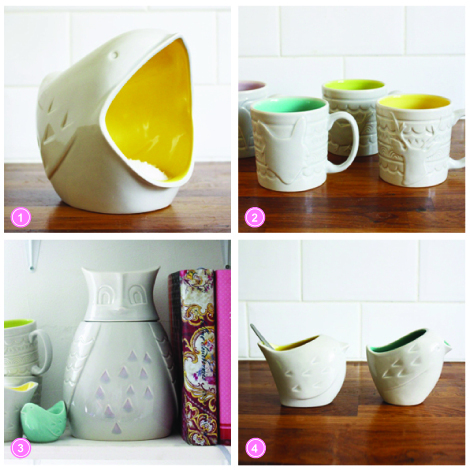 It was the owl storage jar that grabbed my attention, then I spotted the salt bird, the bird milk jug and sugar bowl set and the mugs & that was it, SOLD! It's got the playful quirkiness of J.A but with that all important splash of colour! … Love it! The salt bird i think is deff my favourite, i've managed for 24 years without one, but now i'm pretty sure it's imperative that I have one in my life, it's hysterical. What's your fave from the collection? !